Lots of little projects going on right now. I finished another pair of basic ribbed socks for myself. I used Elann Esprit this time, which seems to be exactly like Fixation. I can’t tell you how much I love these socks. Despite what they label says they have held up perfectly to the washer & dryer. The best thing is they don’t fall down! I have a big problem with socks slipping inside my loafers & these stay right in place. There’s a couple new babies coming this spring so I’m working on gifts. I finished this embroidered onesie yesterday. 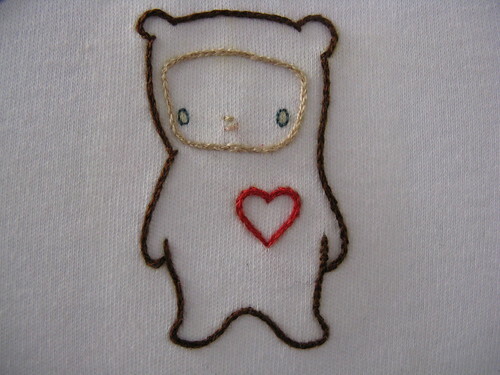 I found the absolute cutest embroidery patterns on Badbird’s & this in one of them. She has a couple more I have plans for as well. Check out her etsy store too, I think I have to buy at least one of her prints. 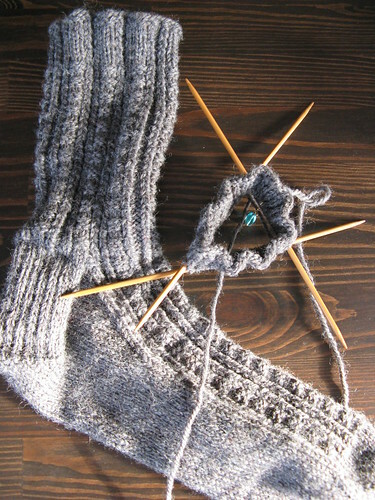 I started another pair of socks for Matt. 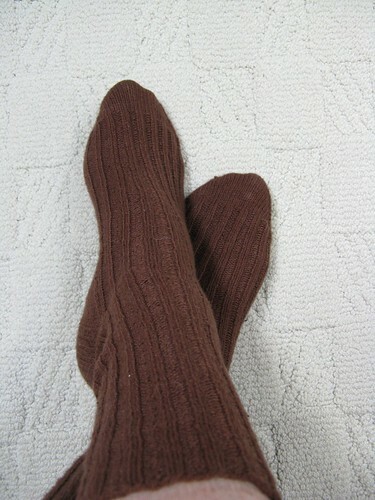 These are the Retro Rib Socks from Favorite Socks. I had to go up a needle size to make them fit him. The yarn is Paton’s Classic Wool Merino, I got a ball free while teaching at Knit Out & thought it would make a good thick winer sock. 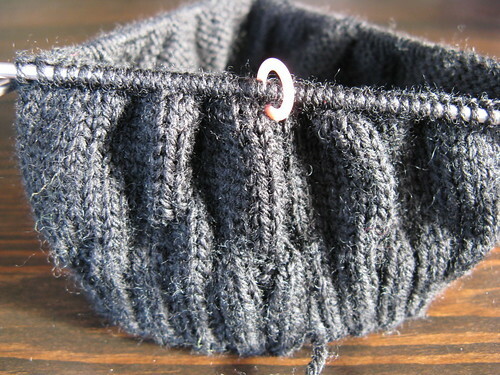 Finally, I’ve started on another baby gift, a little baby skull cap. This will get skulls & crossbones duplicate stitched on after its knit. Is made from Dale Baby Ull. I’m also tossing around a few new toy patterns in my head. 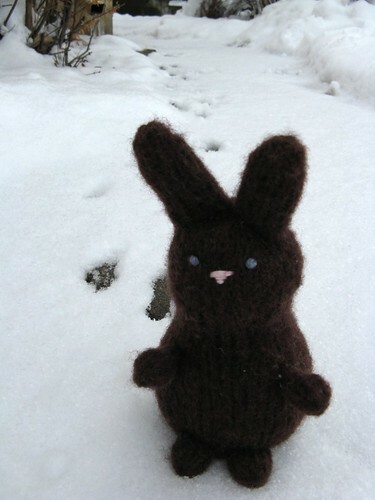 Thanks so much to all of you who bought my Bunny Pattern so far & also to all of you who have knit my little chicks & said such good things. 11 years ago by Kat in Crochet , Embroidery , Knitting , Needlecraft | You can follow any responses to this entry through the RSS feed. You can leave a response, or trackback from your own site. The socks are super cute. They look really comfy, and omg that onesie embroidery is awesome!